AMES, Iowa -- What started out as a favor turned into an award-winning design project and volumes of life experience for two Iowa State University architecture students. Ann Cashman, Waverly, and Darian Lu, Shanghai, are graduating this weekend with the professional bachelor of architecture degree and a truly remarkable project in their portfolios. It probably contributed to Lu's acceptance into graduate school at Columbia University, New York City, to study advanced architectural design. And Cashman is headed abroad to work. The two volunteered their time to design an outdoor amphitheater for the City of Waverly that even the neighbors like. And, not only did it win second place in a national community design competition, it's likely to be built. "This went further than we expected," Cashman said. Downloadable montage by Darian Lu and Ann Cashman. Last spring, Cashman had a request from her mother: A former teacher needed assistance with "a proposal or something" for a band shell on behalf of the Waverly Municipal Band. Cashman agreed and soon enlisted help. "I was free that summer," Lu said. "I always think about doing projects - beyond school - that will help the community. I thought, 'Lets do something for real.'" Cashman also asked College of Design Dean Emeritus and Architecture Professor Mark Engelbrecht to advise. Both hailed from Waverly and talked a lot about "what the town used to be like." "I really wanted him involved in something that was part of his heritage and meant something to him," Cashman said. It was "very entrepreneurial of them" to take the project on, Engelbrecht said. "They did it because they wanted to and saw there was a real need. That's why I wanted to encourage them," he said. "It's gratifying when students will extend their talents in this way." After seeing how much effort they put into their design and presentations, Engelbrecht arranged for Cashman and Lu to receive two academic credits for independent study. "These two students have learned a lot about how projects are done within communities. They recognized a community's need, then put together something very interesting and thoughtful," Engelbrecht said. "Then they handled the usual pushes and pulls of a public site and other pressures that come with any town project." Or as Cashman put it: "This has been very political." Cashman and Lu presented their proposed design to the City of Waverly's Leisure Services Commission, and later to the City Council. That's when things really started getting interesting. "Some residents came to the presentation and were defiantly against the project," Cashman said. The band shell was slated to be in Waverly's Kohlmann Park, where the municipal band regularly holds summer concerts without an amphitheater for the musicians. However, a previous architectural proposal for the project had been misrepresented with a photo of a concrete band shell. The neighbors were not interested in a permanent, concrete structure blocking their park view. In fact, they submitted a petition with hundreds of signatures against the project. "When it involves the public, working with a client is kind of overwhelming," Cashman said. "You're trying to put your project in the best light and people are putting it down. That takes it to a whole different level." But Cashman and Lu took the neighbors' criticisms to heart and created a design that carefully addressed each: A simple, elegant structure that allows light to pass through colored-glass columns or ribs. And they moved the site to the other side of the park, away from residences and closer to the commercial area of town. "It was an effective method of dealing with the not-in-my-backyard aspect of the situation," said Tab Ray, the city's Leisure Services director. It also helped that the Waverly Municipal Band started a petition in support of the Cashman-Lu design. They gathered 800 signatures. "And the students used innovation in their design," Ray said. Cashman and Lu with site model and petition. Photo by Keith Collins. The curved ribs of colored, recycled glass form a visual crescendo behind the elevated stage, rising to a height of 16 feet before sliding down to only a few feet tall. "The glass panels have a purpose, too," Cashman said. "They project sound. And they won't vibrate or break because the glass is thick. The curves bounce the sound around rather than focusing or dampening it." For audience seating, they recommended Grass Pave - a natural grass on top of a plastic crisscross membrane. The recycled plastic material holds roots in place and allows water to move through. "It's a great material," Lu said. "Natural grass on its own is uneven and bumpy, so it's not accessible. This works well for wheelchairs and lawn chairs. And it prevents erosion, which helps the park's flooding issues." "The use of sun angles to make the different glass colors display makes the performance amphitheater into a piece of public art," Ray said. At the end of fall semester, the students learned of a national design competition that fit their project perfectly. The "Un-Competition Project" was cosponsored by the Chicago Architectural Club and hosted by the School of The Art Institute of Chicago. It promoted design entrepreneurship by inviting professional and student designers to go out into their communities, "invent" design projects, design them and figure out how to get them built. "That's exactly what we had been doing," Lu said. They submitted a video that tells their story. 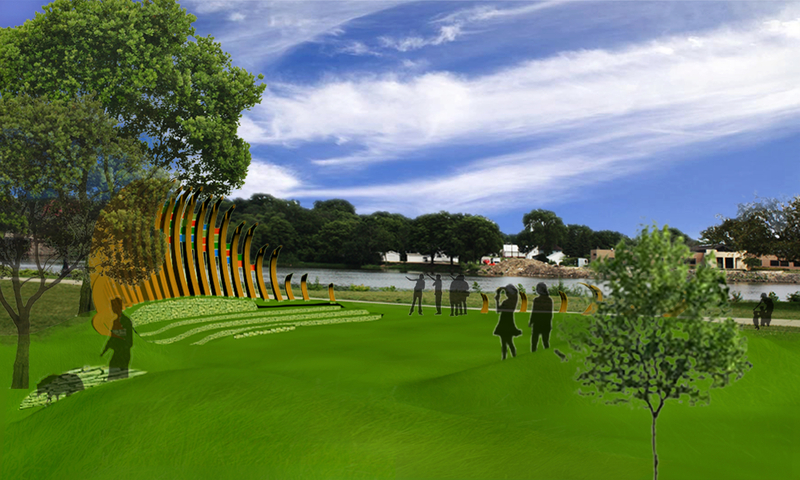 And a jury of professionals selected "The Waverly Amphitheater Design" for second place, which included a $500 cash prize. The award is just icing on the cake, however. "We put the proposal out there to get an idea of what could possibly be there and ours is the design they want," Cashman said. The City Council approved $1,000 to hire a licensed professional architect to take the next step. "This was a difficult situation that was handled very well," Ray said. "The ideas brought forth were intriguing enough for the decision makers to ask to go the next step - to get costs and a firmer design concept. The ideas of the students have a good chance to become reality." "It's been an interesting evolution of events because we didn't think this would actually be built," Cashman said. The students' video about their project. What started out as a favor turned into an award-winning design project and volumes of life experience for two Iowa State architecture students. Ann Cashman, Waverly, and Darian Lu, Shanghai, are graduating this weekend with the professional bachelor of architecture degree. The two volunteered their time to design an outdoor amphitheater for the City of Waverly that even the neighbors like. And, not only did it win second place in a national community design competition, it's likely to be built. "These two students have learned a lot about how projects are done within communities. They recognized a community's need, then put together something very interesting and thoughtful. Then they handled the usual pushes and pulls of a public site and other pressures that come with any town project." "It's been an interesting evolution of events because we didn't think this would actually be built."